Please note that from 1HP to 200HP foot and foot/flange mounted 2, 4 and 6-pole motors need to fulfill IE3 and flange mounted motors IE2 requirements. In addition all 8-pole motors up to 200HP need to fulfill IE2 requirements. Please note that from 1HP to 200HP foot and foot/flange mounted 2, 4 and 6-pole motors need to fulfill IE3 and flange mounted motors IE2 requirements. In addition all 8-pole motors and/or all 2,4, 6 and 8-pole motors from 201 to 500Hp need to fulfill IE2 requirements. Please note that starting 1.1.2015 motors with output power 7,5kW up to 375kW in 2, 4 and 6-pole with IE2 efficiency level can only be used with a variable speed drive within the European Community. AU MEPS is equivalent to IE2 or for some output powers slightly higher. AU HE MEPS is equivalent to IE3 or for some output powers slightly higher. Minimum efficiency requirement according to the country of final use. Search will show all motors which may be used on the market following MEPS regulation in question: both motors under the MEPS regulation and motors which are not relevant to the regulation. Motors not relevant to the regulation are marked with yellow triangle. Input the product code to quickly find the motor you are looking for. Start your selections by selecting a meps. If you would like to save your selections in any view, locate and click the "Add" button nearby. Are you sure that you want to clear your motor list selections? Cost of ownership - Which motor costs more? To see the real price of any electric motor, you have to dig behind the purchase price: cost of motor running, and cost of not running, too. The calculation is not difficult but certainly worth doing. The figure you get is total cost of ownership, the actual effective price you are paying for the motor, and therefore the optimal measurement for comparing motor investments. A figure even more eye-opening is the cost of ownership ratio. It shows how big or small role the purchase price plays in the total cost of ownership and in the return of your investment. Click here to to get a corresponding motor with higher efficiency class. Are you sure that you want to clear your saved calculations? Interested in rewinding a motor? Click here » When a motor fails the user has the normal choice between rewinding and replacement. The user should carefully consider the advantages of replacing the motor rather than having it rewound. Each rewind normally reduces a motor’s efficiency by 1 - 3%. In many cases the payback period is short when comparing a new motor versus rewinding. The additional cost of purchasing a new high efficiency motor when compared to the cost of the rewind can be recovered in energy savings typically within 1 year of continuous running. How can a motor cost money when it’s not running? When a motor fails it often causes unscheduled downtime. The cost of not running is the cost of any production that is lost, plus any other costs that arise because of the downtime. So the cost of not running is basically the cost of motor failure. It’s easy to overlook the cost of not running because it’s a hidden cost. It varies a lot between industries, and in some sectors - like chemical, oil and gas – it can be huge. In any case, it’s an important part of a motor’s overall cost of ownership and it should be taken into consideration. Fortunately, it’s possible to reduce the cost of not running by means of maintenance. ABB offers a unique selection of service tools that support both preventive and predictive maintenance, enabling the right maintenance to be carried out at the right time. Assesses the condition and expected life of the stator winding. Identifies rotor winding defects, installation problems and bearing defects; analyzes power supply quality. Remote condition monitoring service that covers the cage rotor and bearings; also addresses temperature issues. 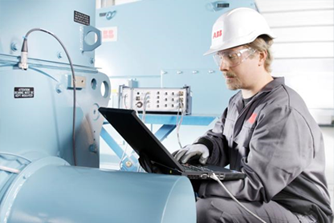 ABB Life Expectancy Analysis Program (ABB LEAP) is a diagnostic tool for assessing the condition and expected life of the stator winding insulation in motors and generators. Testing is done on a single occasion and can be combined with normal maintenance procedures. By providing information on the remaining lifetime of the stator winding, ABB LEAP enables motor operators to plan specific service actions well ahead. This approach significantly reduces unplanned shutdowns caused by failures (due to factors such as thermal, electrical, ambient, or mechanical aging), which could have been foreseen. ABB MACHsense-P is a condition monitoring service that addresses the reliability of the complete shaft line, including the motor, gearbox and driven load (pump, fan or compressor). It identifies electrical and mechanical issues related to the rotor, bearings, gearbox and other components – problems which account for a major percentage of total failures. ABB MACHsense-P is a walk-around condition monitoring service offered by ABB. It provides reliable early warning of defects, allowing more time for effective maintenance action. 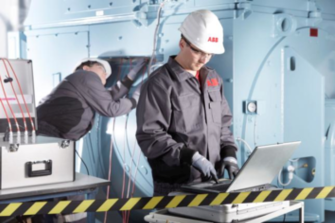 ABB MACHsense-P uses an integrated approach, applying the same hardware and software to detect, monitor and diagnose electrical and mechanical problems in the entire shaft line. 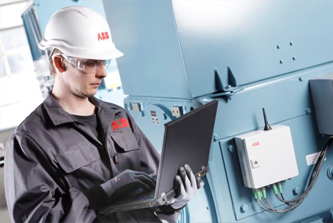 ABB MACHsense-R monitors key parameters related to the condition of the motor or generator. Authorized users can access the analyzed data over the Internet from any location for up-to-date information on the condition of the equipment. The system issues an alert if a measured parameter exceeds its set limits, giving the plant operator an early warning that maintenance is required. The service is based on a custom Data Analysis Unit (DAU) that is mounted on or near the motor or generator. Sensors collect vibration, temperature and optionally electrical data - depending on accessibility for mounting sensors – and the raw data is processed in the DAU to generate Key Condition Parameters (KCPs). The KCPs are transmitted to a secure ABB server, generally over the mobile phone network (GPRS/3G). The server monitors the KCPs and generates an alarm when an operating parameter exceeds its predefined thresholds. Are you sure that you want to clear your document selections? Close this window once you've received your document package. Send a link to the downloadable zip-package by entering your email below. In this list you can view your selections and choose which documents you would like to add to your final export package. In order to remove a document from your export-package, uncheck the box next to it.